This dessert tastes like summer feels. Summer produce is like nature’s candy. I don’t mean that in some hippy dippy way or that candy is in any way a bad food group, I just mean that fruits and veggies right now are so delicious when the sun and the rain and the dirt are all working together to create pure awesomeness. Ok, so I’m a little hippy dippy about it. But, since we were having company over for dinner this weekend, I decided that I would fancy it up and crock pot us a cobbler to enjoy. And as leverage for the delicious vanilla caramel swirl ice cream I had bought as well. 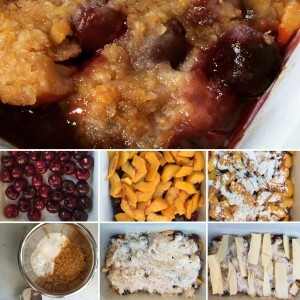 Most cobbler recipes include oatmeal in the topping. Makes sense– it stands up well in the crock pot, gets soft, but not mushy, and you usually have it in the pantry. Except this time, I didn’t. And I didn’t want to go on a grocery store run just for oats. So, I opened the pantry and just started creating. While you could do this in an oval crock pot, I really liked doing it in my casserole crock pot because it made perfect squares for serving, plus it wasn’t too deep or too crispy on the sides. Literally, the casserole crock pot was the perfect choice. Turns out– corn flakes make a great cobbler topping, too! I will totally make this recipe again. It’s just the start of blueberry season here locally and I’m thinking about going to do some local picking and then making cobbler again. 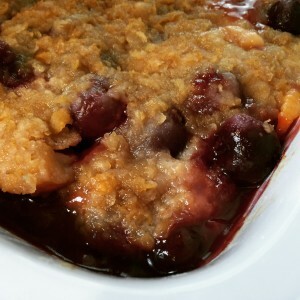 Mmmmm can you picture the dark purple color as those berries begin to burst in the cobbler and the sweet smell of the caramelizing flavor?! Yeah, me too. Go get some local produce and make a batch for yourself today! Here’s a step by step look at how to make Crock Pot Peach and Cherry Cobbler. Put cherries and peaches in crock pot, add corn starch and stir until fruit is coated. In a separate bowl, mix the rest of the dry ingredients and then sprinkle it over the fruit. Slice the stick of butter horizontally (long thin slices) as thin as possible. It’s easiest to cut the butter when it is cold. Place butter over crumbled topping and cover as much surface area as possible. Cook on high for two hours and then low for two hours. This helps the fruit– especially the cherries– cook all the way through. Serve with a huge scoop of your favorite ice cream or greek yogurt.